It's easy to dismiss the Holy Ghost People. They travel door-to-door in white sheets spouting pseudoscience about time travel, wormholes, and a new galactic gospel. Most of the town has already laughed them away. But when the Holy Ghost People start to perform "miracles," denial becomes difficult, and conversation quickly shifts to what ought to be done. 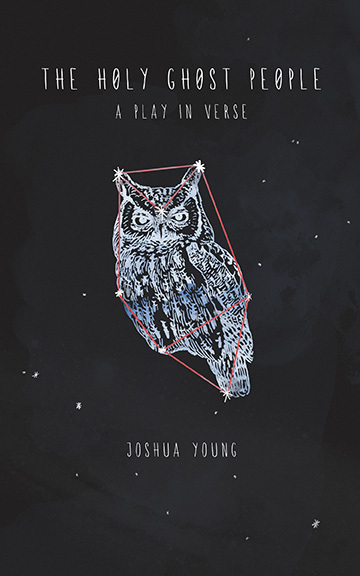 "Like Samuel Beckett, Joshua Young's brilliant play in verse captures the 21st century struggle to manifest truth when 'God's justice implodes in the stardust.' Young's Speakers and Holy Ghosts express a weary but hopeful skepticism about the soul in this exciting new work of eschatological theatre." "When a poet writes a play I'm there! What I love about Joshua Young's poems being off-center I love about his play THE HOLY GHOST PEOPLE. Yes, you want to see it performed, but reading it creates a stage no theatre can live up to. Come drink from the same water; Joshua Young is a remarkable Virgil to chaperone our sorry asses to where the real world is the written." "THE HOLY GHOST PEOPLE is Our Town meets Waiting for Godot. The familiar world of parking lots, farmers' markets and dive bars is transformed by a new kind of stranger. The Holy Ghost People remind us of the serious questions about the afterlife and memory, ghosts and nonbelievers, science and illusion. In alternating choruses with the skeptical Speakers, the play invites us to question easy binaries. What is proof of the holy? Of the profane? What happens when love turns to pity? Is faith an illusion? A drug?" "Joshua Young is one of the most ambitious and exciting writers out there, and THE HOLY GHOST PEOPLE is his most daring work yet. In his exploration of the cosmic crossroads of faith, science, dogma, and community, Young gifts us a profound, disorienting, and darkly comic play in verse." "With THE HOLY GHOST PEOPLE, Joshua Young introduces the bombast and fervor of Jesus Christ Superstar to the frantic lyrical inventorying of Jubilate Agno. While the players argue about the nature of belief and reality, we fall more in love with our crowded, profane world."